Our recommended starting dose is 1 ml. of each component per 4 gallons of aquarium capacity per day. Maintain alkalinity between 3.0 and 3.75 meq/liter (8.4 and 10.5 dKH) by testing daily and adjusting dose accordingly. Depending on the degree of calcification occurring in the aquarium, dose may have to be significantly increased over our recommended starting dose. Never add more than 1 ml. per gallon of each component in a 24 hour period, and never allow pH to rise above 8.45. Once the proper dose has been determined for your aquarium, testing can be performed less frequently. If your aquarium tends to run at a higher pH (over 8.45) we suggest you try our B-Ionic Calcium Bicarbonate System. 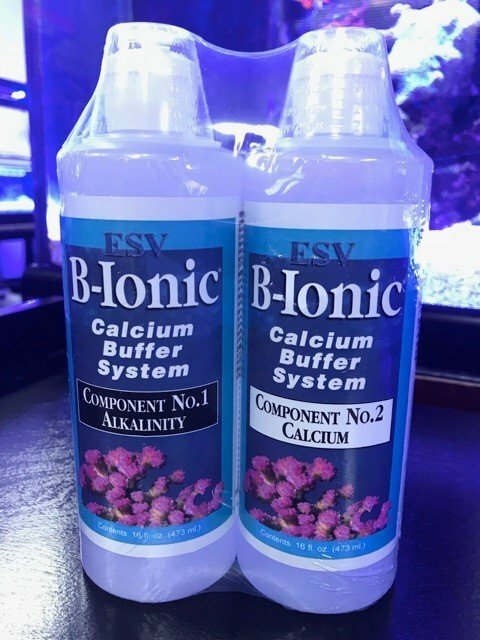 When using kalkwasser in addition to B-Ionic Calcium Buffer System, follow the above procedure but start with 1 ml of each component per 8 gallons of aquarium capacity per day. For more detailed directions please refer to our product label. Component A - Carbonate Alkalinity: 2800 meq/liter (7840 dKH). 1 ml per gallon of aquarium water will raise alkalinity by 0.74 meq/liter (2.07 dKH). Component B - Calcium Concentration: 54,000 ppm calcium ion. 1 ml per gallon of aquarium water will raise calcium concentration by 16ppm.